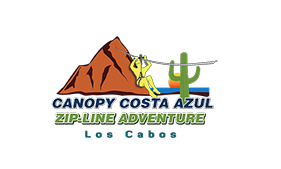 We are located in San Jose del Cabo, Baja California Sur, Mexico, in the Costa Azul area (Costa Azul beach, Costa Azul viewpoint, Costa Azul Canyon, Costa Azul Bridge), at Kilometer 28.5 on the "Transpeninsular Highway" . Drive south on the Transpeninsular highway, go past the "MEGA" Store and get off the Costa Azul Bridge to your right, follow the dirt road (dry riverbed) into the canyon about 1.5 miles, there you will see our location, it's impossible to miss. Drive north on the Transpeninsular highway to San Jose del Cabo, for about 20-30 minutes (depending on driving speed) or 17.5 miles, after you pass the Palmilla area keep to your tight and take the next exit (The costa Azul Bridge, point A on the above map), then drive under the bridge into your left, follow the dirt road (dry riverbed) into the canyon about 1.5 miles, there you will see our location, it's impossible to miss.